To Sun or Not to Sun? Q: I am in the sun a considerable amount. How can I keep up my sun worship but not look like a dried up raisin by the time I’m 40? Mimi and Mademoiselle know a thing or two about being in the sun and how to protect yourself from too much Mother Nature. Your first line of defense is using a good sunscreen everyday. We use SkinCeuticals Physical Fusion UV Defense SPF 50. If it’s a day at the lake or beach we power up to the SkinCeuticals Sport UV Defense SPF 50 for our face. Our second line of defense is to layer your sunscreen with a liquid or powder foundation with SPF. 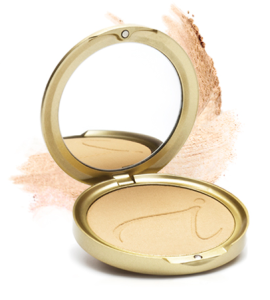 There are a myriad of good products but we prefer the ease of Jane Iredale Pure Pressed Based Mineral Foundation. Third, invest in hats, preferably wide brimmed and natural material. Mimi’s favorite is the Helen Kaminsky Standard as featured in our Weekend Water Warrior column. But there are a myriad of styles and materials to choose from. Any hat will do! Use the same products on your face for your neck and décolletage! Trust us, in a few years you will be thankful you did. The little extra bit of time and product will pay off in spades later in life. 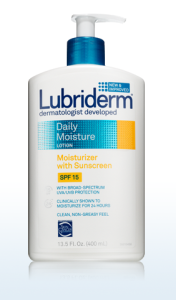 For the rest of your body, you can start out of the shower with an all over SPF body moisturizer, like Lubriderm Daily Moisture Lotion. It’s inexpensive, and at least gives you an SPF 15. Pick your favorite and try to make a habit of using it everyday. If you’re going out for swimming, boating or other outdoor activities, we recommend you also use a SPF 30 or higher waterproof sunscreen all over. 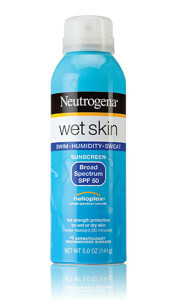 We use Neutrogena Wet Skin products. Lastly, if you do get a sunburn and need a coverup, there are many to choose from, but you can get the maximum SPF protection from either the men’s or women’s Columbia shirts. Not only do they provide protection from the sun, they’re very cool and comfortable. 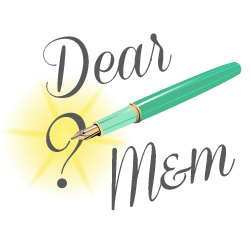 Mademoiselle has a men’s XL that she had monogrammed with her initials – very cute indeed! Check out a few more of our tips for Après Sun Beauty!